Mulching is one of the best things you can do for your trees. Mulches are materials placed over the soil surface. 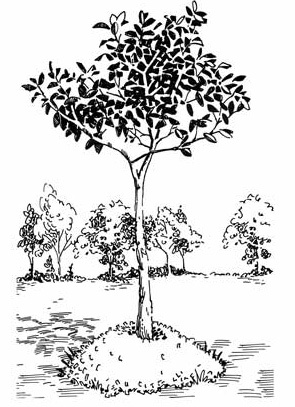 An area of mulch over the root zone of a tree helps maintain soil moisture and protects the tree from mowers and weed whackers. It also helps control weeds and insulates the surface of the soil over the feeding roots of the tree. As an added advantage, the mulched area will give your beds a well-cared-for look. But mulching can be carried too far. More and more I see mulch piled up at the base of a tree. Often the mulch extends several inches up the bark at the base of the tree covering the crown of the tree completely with mulch. This deep mulch can lead to problems for your tree. 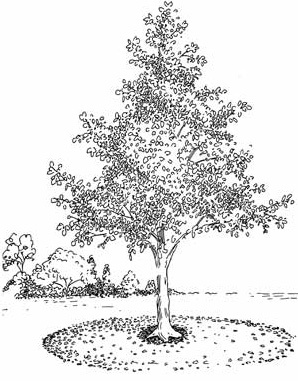 The crown of the tree where the roots and trunk meet should be at the surface of the soil and open to air. The nutrient carrying conduits of the tree are just inside the bark. Building a mulch volcano over the bark can open the area to insect and disease problems. Mulch piled high against the bark also makes a perfect habitat for rodents that chew on the softened bark. Once the bark at the base of your tree has been compromised by insects, disease or rodents, your tree will begin to die. To avoid these problems, keep the mulch to a 2- to 4-inch layer in a doughnut-shaped ring. Make sure the mulch is pulled away from the bark at the crown. The ring of mulch should extend out to the drip line if possible.